Good morning!! I hope everyone is doing well today. 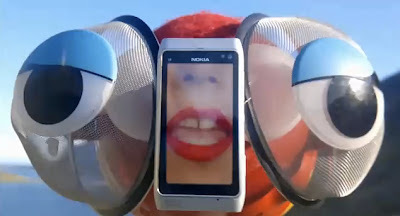 This morning I bring to you a commercial for the very hyped Nokia N8. What's unique about this is that the entire video was shot with the N8! The idea was to try showcase the phone's HD video capabilities, it has a 12 megapixel camera as well! The video, titled Dragonfly Love, is a pretty bizarre piece of work that features two fisherman and two dragonfly's outfitted with the N8 as they battle it off. Besides the techno sounds that come with the commercial, I find the whole thing kind of catchy. I don't know what it is, but theres something about it that I like. I'm pretty sure it has something to do with the techno beats. I've also included a "Behind the Scenes" look at how this video was made, so that's definitely worth checking out! As always, please remember to leave your comments! Making of Dragonfly Love from The Dragonfly Love Project on Vimeo. Yeah, I don't quite understand what's happening exactly. The whole fish thing confuses me too. I just thought it was pretty cool that it was shot with the phone!